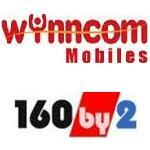 Wynncom mobiles entered into an exclusive agreement with 160by2.com. Under this agreement Wynncom mobile phones will have preinstalled mobile application developed by 160by2.com. This application enables mobile phone users to send free SMS to any mobile not only in India but also in Singapore and Malaysia. Another feature provided by this application is that the user can access the phone book on the mobile to send messages. One can also save mobile phone contacts on 160by2.com as a memory back-up. We find nothing great in this agreement. Anybody can download 160by2.com app and use it in his/her mobile if the app is compatible with the mobile.